Beacon Light turned the Lights On with his last album. Now we need Open Eyes to see the light. He turns on the electronic sound for this album, which has its advantages and disadvantages. There’s some intense rapping and deep meanings in this one, so let’s dive in. “Open Eyes (Intro)” starts the album off right with a cool buildup. The track begins with singing and a smooth transition into Beacon Light and a slow, spoken-word style of rap at first. The beat slowly picks up and creates a great feel instead of jumping straight into the album from nothing. There’s some pretty good rapping in the track as well. The next track has the longest acronym I’ve ever seen in music. “Y.W.N.T.M.D” (feat. Steven Malcolm) stands for “You Will Never Turn Me Down” and continues off the end of the intro as a pump up track. Beacon Light and Steven Malcolm work very well together to create a cool track on this one. The track has some of the best rapping on the album as Beacon Light works a quicker style that sounds awesome, and then Steven Malcolm makes it even better with his epic verse. Some cool electronic sound, good use of bass, and great rapping make this a great track. “Overload” (feat. Kaylee Johnson) keeps the high energy flow going in an awesome way. The refrain is epic, and it meshes great with Beacon Light’s rapping. The meaning behind this track is that God’s love is so much that it overloads us. The added effects throughout the track with more electric flair fit the theme very well, though the electric noises are a little overused. Overall there are just a lot of little factors that make this track another really cool one to listen to. Moving on, I see what he was trying to do with “Color Blind” (feat. Chase Stancle), but it is just a pretty poor sounding track overall. The first verse’s use of “black” and “white” at the start of almost every line ends up being fairly corny in my opinion. There’s times where there’s heavy bass and drumming, and it just doesn’t fit. Beyond the first verse, the rapping is actually pretty good, but the poor use of bass takes away from it. Beacon Light’s part of the refrain also hard to listen to. The track definitely does not reach its potential and is just plain hard to listen to honestly. “Party” (feat. George Moss) and “Can’t You See” have very different sounds, but both work in their own ways. The background music for “Party” is really cool. The beat along with the background sounds create a base for Beacon Light and George Moss to have some fun rapping that adds the last touch to make this one to listen to on repeat. “Can’t You See” utilizes the guitar well at the start to transition into a bit of a slower style of rapping. The bass meshes with the vocals well to keep the track interesting and the refrain is so catchy too. Jumping forward a few tracks, “Never Die” is another track that had a ton of potential but didn’t reach it. The start of the refrain, where there isn’t all the extra sound, is probably the best part of the track. The bass and electronics just become too excessive at times while he’s rapping, and that takes away something from the sound. The effects are a cool addition if used correctly, but the volume is too high on them, drowning out the rapping. Overall it’s still a decent track, but some better mixing and mastering would have made it a very good track. “Heal Me” (feat. Briana Bailey & B. Coe) slows things down a little. This track avoids the problem of too much extra noise and instead finds a great median. The use of the piano along with a great beat compliment both Beacon Light and B. Coe’s rapping. The backing off of the intensity works very well with Beacon Light’s voice actually. It also fits the tone of the song, which is asking God to bring his hope back and heal him. It is a great track overall as everything just meshes well. The final track, “Jesus Loves Me”, made me pause for a while. The song hits hard. It’s a hard one to explain. He talks about his struggles as a child, from being molested to his parents becoming divorced. The sound is solemn, and his voice sounds hopeless. He explains how he was lost, “Alone, that’s how I felt, handling my problems by myself, I didn’t need God, so I thought”. Brokenness was the story of his life. His storytelling is done extremely well in the first four minutes of the song, as he explains his pain. The pace starts to gain momentum after he says, “I’m so lost, which way to go, I don’t know, all I know is I need you God, to take control, please take control, and change my ways”. As the music picks up to have a more positive breakthrough, he continues his call for help and praise. Beacon Light’s intense style is awesome as the drum comes in hard. The meaning and sound of this song make it absolutely terrific, and it is the perfect ending to the album. There are some really great tracks in Open Eyes that use the electronic heavy flair to its finest. There are also tracks that could have been better if there wasn’t so much of that electronic sound. Beacon Light throws in a mix of songs with a more dance style as well as songs with deeper meanings for a good album flow overall. He shows flashes of cool rapping in “Y.W.N.T.M.D” and “Overload”, and he just needs to continue that consistency throughout the rest of his tracks. At times it can just sound like he’s yelling instead of rapping with intensity. The album is still a pretty good one overall, and it is worth grabbing for the really good tracks it does have. 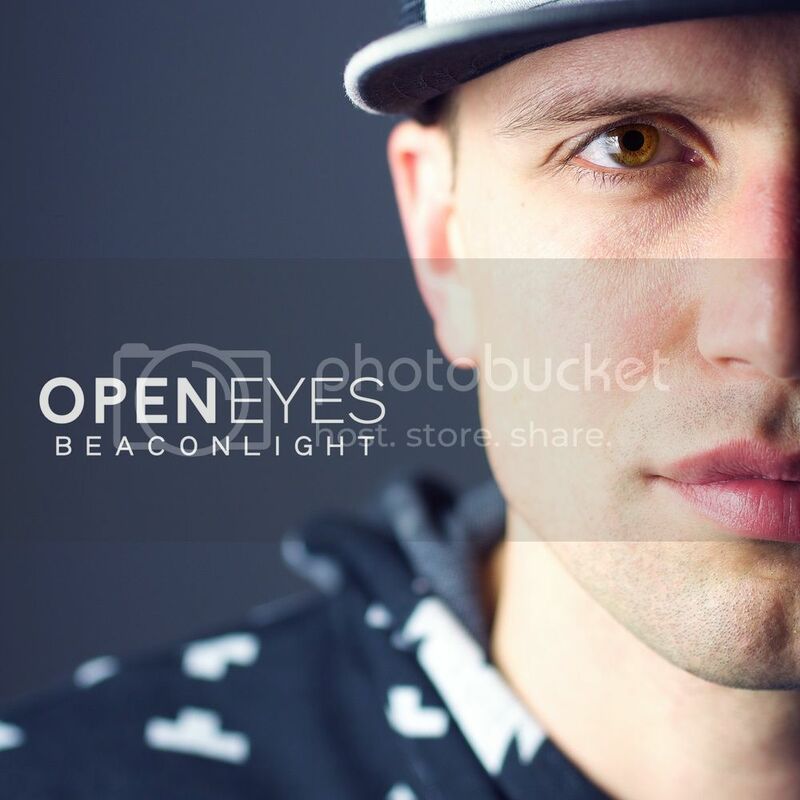 Open Eyes is available for sale on iTunes and other digital retailers.